On Aug. 7, the Los Gatos-Monte Sereno Police Department and the Canine Specialized Support Team conducted a search around Lexington Reservoir for a missing Los Gatos woman, Jeanine Sanchez Harms. Police Sgt. 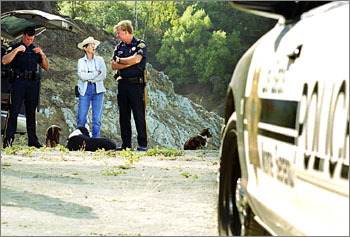 Tam McCarty (right) speaks with volunteer Shirley Hammond (in hat) before Hammond and her dog, Spice, begin the search. The Canine Specialized Support Team is a county resource that uses dogs to search out human remains. Harms, 42, has not been seen since July 27 after she went out with friends in Campbell. A $10,000 reward fund has been established, and a fundraising dinner was held at Rock Bottom Brewery in Campbell on Aug. 9. The Los Gatos Lions Club will sponsor a fundraiser Thursday to benefit the reward fund. The event, a barbecue, will take place at the Los Gatos Lodge, 50 Los Gatos-Saratoga Road, from 5:30 to 8:30 p.m. Cost is $20.